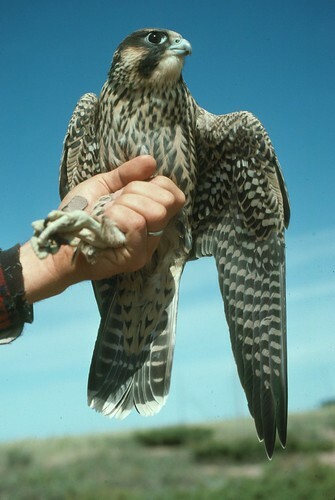 Tom banded this Peregrine falcon on Outer Island in the Apostle Island National Lakeshore in 1993. In 2009 he received a band number report on one of the 20 peregrines he banded in 1993. The bird’s leg was found in the mountains of Switzerland. Tom just published a paper in the Journal of Raptor Research on this finding. You can read more about the story in this article in Birdwatching Magazine. http://www.birdwatchingdaily.com/Getting%20Started/Birding%20Briefs/2013/04/Peregrine%20Falcon.aspx.